I am happy to welcome a new partner, Ross Cameron. After a career in biotechnology, Ross makes a boatbuilding training at the International Boatbuilding Training College [IBTC] in Lowestoft. Then he worked on various boat-building projects before setting up Cameron boat builder. 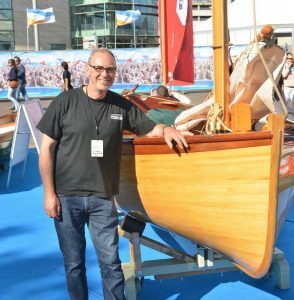 He specialises in the construction of new boats such as those designed by Francois Vivier, using wood/epoxy composite (strip-planking) techniques. The first boat built is an Ilur which was present on the last Southampton Boat Show (2015). This Ilur is beautifully built with a strip planked hull made of Alaskan Yellow Cedar. Trois doigts par terre !